Among the many innovations that transformed Europe in the Middle Ages, perhaps none was more central than the metamorphosis of the written word. The evolution of writing in this period reached a dramatic climax in the 1450s, when Johann Gutenberg invented moveable metal type—and revolutionized human communication. This exhibition traces the history of the medieval book—its appearance, content, audiences, and forms—from the 9th to the 15th centuries. 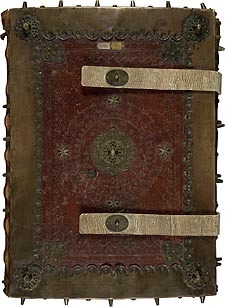 Drawn from the holdings of Cornell Library’s Division of Rare and Manuscript Collections, the exhibition presents a rich variety of medieval manuscripts and printed books, from early religious manuscripts and illuminated prayerbooks to the secular works of classical antiquity and the first books printed from metal type. Lombard Gradual. Northern Italy, mid-fifteenth century.